Right-sided endocarditis occurs predominantly in intravenous drug users, patients with pacemakers or central venous lines and with congenital heart diseases. The vast majority of cases involve the tricuspid valve. A case of a 31-year-old woman with intravenous drug abuse who had a right-sided vegetation attached to the muscular bundle of the right ventricle is presented. Transthoracic echocardiography revealed a vegetation in the right ventricular outflow tract. Transesophageal echocardiography clearly showed that the 1.8 cm vegetation was not adherent to the pulmonary valve but attached to a muscular bundle. Our case points to an unusual location of right-sided endocarditis in intravenous drug users. It confirms that TTE remains an easy and highly sensitive first-line examination for the diagnosis of right-sided endocarditis. Right-sided endocarditis occurs predominantly in intravenous drug users, patients with pacemakers or central venous lines and with congenital heart diseases . The vast majority of cases involve the tricuspid valve. We describe a previously unreported condition of right-sided endocarditis in a patient with intravenous drug abuse attached to a muscular bundle of the right ventricular outflow tract. A 31-year-old woman with a history of intravenous drug abuse was admitted with acute lumbar pain and fever. Physical examination revealed a temperature of 39.5°C and signs of lumbar arthritis. No murmur or extra sound was heard. Clinical examination was unremarkable, including the electrocardiogram. C-reactive protein was 172 mg/l (normal value < 5) and white blood cell count 18400/mm3. Multiple blood cultures grew Staphylococcus aureus. Chest radiography revealed a cavitating nodule of the right upper lobe consistent with a septic pulmonary embolism. Magnetic resonance imaging showed L3-L4 spondylodiscitis. Vertebral biopsy was positive with Staphylococcus aureus. 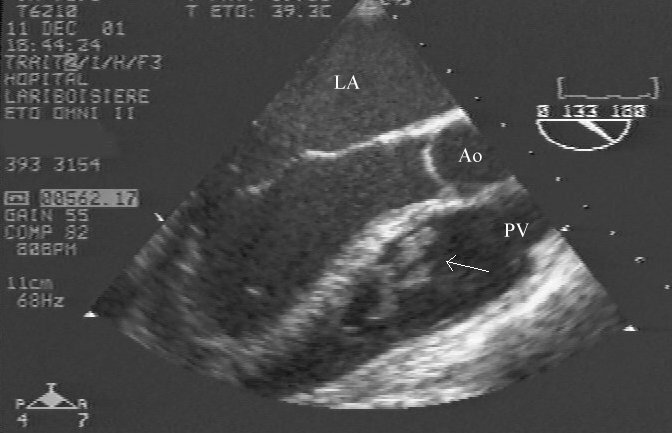 Transthoracic echocardiography (TTE) found a pedunculated, highly mobile, mass in the right ventricular outflow tract (Figure 1, Video-see additional file 1). It was not possible to describe precisely the attachment of this mass or its underlying cause. However, its floppy nature and echodensity was compatible with a vegetation. A previous TTE examination performed 6 month earlier was normal. Transesophageal echocardiography (TEE) confirmed the absence of valvular involvement and congenital heart disease. The mass was pedunculated and included two portions of maximal extension 1.8 cm. This vegetation was at a distance from the pulmonary valve and appeared attached to the muscular bundle of the right ventricle (Figure 2). A trivial pulmonary regurgitation was present. According to the Duke criteria , a definite diagnosis of infective endocarditis was established. The patient recovered well with intravenous antibiotic. Repeat TTE on days 8 and 16 revealed no changes in the mass. Chest radiography returned to normal. No further follow up could be obtained. Long axis parasternal view showing vegetation (arrow) in the right ventricular outflow tract. LV, left ventricle. Transesophageal view (133°) of two vegetations (arrow) attached to a muscular bundle. Ao, Aorta; LA, left atrium; PV, pulmonary valve. Right-sided endocarditis accounts for only 5–10 % of cases of infective endocarditis . It has been estimated that up to 76 % of cases of endocarditis among intravenous drug abusers involve the right heart, compared with only 9 % in nonaddict patients. Staphylococcus aureus causes 50 to 75 percent of cases of endocarditis associated with injection drug use. The majority of the cases involve the tricuspid valve. Pulmonary valve endocarditis is mostly associated with tricuspid valve endocarditis and isolated pulmonary valve endocarditis is extremely rare . Eustachian valve endocarditis remains a distinctly rare identity with less than 20 reported cases [5, 6]. There have been isolated cases of infective endocarditis involving the interventricular septum or right ventricular free wall of individuals diagnosed with ventricular septal defect . A case report of an isolated right ventricular outflow tract vegetation without intravenous drug abuse was recently reported . At surgical examination, it was attached by a thin stalk to the right posterior ventricular wall. To our knowledge, there has been no previous report of vegetation attached to a muscular bundle of the right ventricular outflow tract. TEE has been shown to be superior to TTE in the detection of left-sided vegetations in endocarditis . In the study of San Roman et al  using a monoplane probe, TEE did not improve the diagnostic accuracy of TTE in the detection of tricuspid vegetations in intravenous drug abusers. However TEE is helpful in the substantial number of adults in whom TTE imaging of the right heart, especially the pulmonary valve and right ventricular outflow tract, is poor due to technical limitations. In a study by Herrera et al  comparing TEE and TTE for diagnosis of right-sided pathology, TEE identified abnormalities in 37 of 56 cases (67 %) confirmed by other methods in all cases, while TTE correlated with TEE findings in only 12 of 37 cases (32 %). 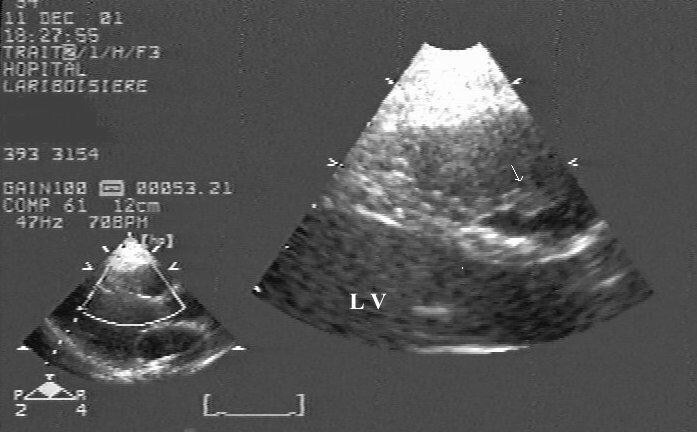 TEE is particularly useful in diagnosing pulmonary valve endocarditis because, in the adult, the pulmonary valve is the most difficult valve to visualize with TTE . Without histologic confirmation of the lesion we cannot completely exclude other differential diagnoses such as thrombus, marantic endocarditis or more likely benign or malignant heart tumors. Right-sided cardiac tumors are rare and most commonly found in the right atrium . Myxomas, the most common type of primary cardiac tumors, are detected in the right ventricle in only 3 % of cases, with 10 % arising solely from the tricuspid valve, chordae or papillary muscle . Papillary fibroelastomas are rare benign cardiac tumors typically attached to left-sided valves. However, among 93 patients of the largest reported series, four had right ventricular chamber localization and there were two pulmonary valve fibroelastomas . They are usually round, irregular in appearance, with well-demarcated borders and having a homogeneous texture. In conclusion, our case points to an unusual location of right-sided endocarditis in intravenous drug users. It confirms that TTE remains an easy and highly sensitive first-line examination for the diagnosis of right-sided endocarditis. Written consent was obtained from the patient's relative for publication of the patient's details. None declared. There are no financial or other relations that could lead to a conflict of interest.